1. To make the pastry, dice the butter, then pulse with the flour in a food processor until the mixture resembles fine breadcrumbs. 2. Add the sour cream and continue to pulse until the dough starts to incorporate into a ball. 3. Wrap the dough in plastic film and refrigerate for 20 minutes. 4. While the pastry is chilling, preheat the oven to 200˚C and prepare the pears. 5. Pop your sliced pears, sugar, lemon juice and zest in a bowl and stir until all the pears are coated in sugary lemony goodness. 6. Roll the chilled pastry out until 3 mm thick and lay gently into your pie tin of choice. 7. Trim the edges around the pie tin with a knife. 8. Pop your pears in the pie crust, nice and neat. 9. Grab the leftover pastry and roll out to make a lid for your pie. I like to make a lattice one so the juices all come out through it, it also looks pretty fancy. If you want to make a lattice lid, just cut your rolled out pastry into strips and place in a criss cross manner over your pie. Cut off any bits that are too long. 10. Fold your pie bottom over your lid. You can crimp it and take it to a whole new level of fancy, but that level is too high for me. 11. Brush the egg over your pie pastry and sprinkle the white sugar over the top. 12. Pop it in the over for about 20–25 mins (keep checking). 13. 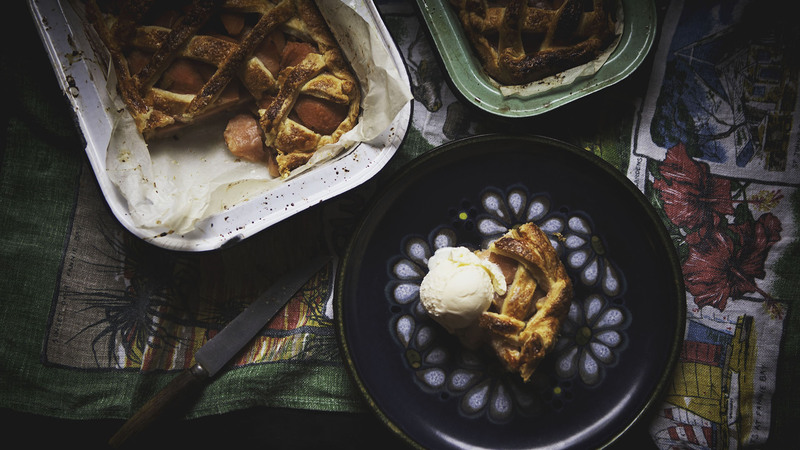 Eat pie with vanilla ice cream.